I must say his name a thousand times a day. It’s usually met with laughter or a scream, followed by the sound of pounding footsteps, as he runs away from whatever mischief he’s causing. Our youngest son, Tommy is our second adventure in the world of autism, although very different from our first. We had always talked about having a large family, but with what we’d been through so far with Jude, we had a decision to make. Would we be able to cope with raising another child? Would we be able to give Jude all that he needed? What if our next child was autistic too? Like many autism parents, I’d spend endless hours trawling the internet, looking for answers to the hundreds of questions swirling around in my head. When doing so I’d come across stories of families with 2, 3, 4, even more children with autism, suggesting there must be some kind of genetic link. That meant that there would be more chance of our second child being autistic too. At the time, autism was very new to us. It was still a big unknown. The anger, heartbreak and fear were all very fresh. The perfect life we’d imagined was turning out to be anything but. So deciding to have another child seemed to be a big decision to make. From my point of view, I guess I thought we couldn’t be that unlucky. It wouldn’t happen to us twice. If we had more children they wouldn’t have the difficulties Jude had, and we’d get to experience everything we thought we were missing out on. We’d have some kind of normal family life. Maybe it would even help Jude be less autistic having a younger brother or sister around. Tommy had a much less traumatic start than Jude. We knew that he too would come early, but this time the doctors seemed much more confident everything was going to be ok. There would be no weekly trips to the hospital, no steroids, no major scares. He was born 6 weeks early but remained in the hospital for only 5 days after birth. With such a stress-free pregnancy and birth in comparison to his brother, we left the hospital convinced that this time everything was going to be different. The first year of Tommy’s life seemed to race by. When he came along Jude had just turned 3, and had started at nursery a few mornings a week. Jude wasn’t sleeping for more than 4-5 hours a night, so adding a new-born baby into that situation meant that life suddenly became pretty stressful! I have to admit I found that time really difficult. I never really got to enjoy Tommy being a baby as Jude took up most of my energy. When I did I could feel myself analysing every little thing that he’d do, constantly on the lookout to see if he too was autistic. Our past experience meant we were fully aware of what signs to look for. The problem with that is you can’t tell whether you’re over-reacting to everything that he does or doesn’t do. I couldn’t help but assess everything he’d do, comparing his progress to that of Jude’s. Was his eye contact better? Was he trying to communicate with us? Shouldn’t he be crawling by now? In fairness, Tommy learnt to move very quickly. He’d become very frustrated at how little he could move to begin with, it was as if he was forcing his body before it was ready. Once he was strong enough to use a baby walker he was off. He would race around at 100mph crashing into anything getting in his way. He found it hysterical and would want to be in it at any opportunity. Tommy would spend a great deal of time thrusting his hips. He’d lay on the floor and thrust over and over. It’s something he still does now when tired or sad. He would never touch any food with his hands. Not to explore, or make any attempt to pick food up, he would just push it away. Tommy loved playing alone. He had no interest in other babies. He would watch older children and adults and laugh, but babies and toddlers he would ignore. When we decided to talk to the doctor about our concerns we weren’t met with the same barriers we had with Jude. We weren’t told we were being paranoid, appointments were made pretty quickly, and we were passed further up the chain to the relevant departments. We were taken much more seriously from the start, either because they believed we knew what we were looking for, or that it really is more likely he was autistic because his brother was too. Just like Jude, it was around the 18-month mark that Tommy was given a formal diagnosis. It was no real surprise. Tommy is much more ‘classically’ autistic than his brother, so the signs were even more apparent. In Tommy’s world everything has to have an order and a place. Disruption to that can be overwhelming to him. It’s not that he feels he has to stick to a certain routine, just that everyone else has to. Unpredictability is a problem, and everything has a certain place. He can spot if something has been moved in a room, and straight away will try and return it to where he thinks it should be. Sometimes, randomly, he will decide that everyone has a fixed place they need to be. If you’re sitting in a chair and go to get up he will rush over to you and make you sit down again. The order in his head cannot be broken! There’s a Mickey Mouse book at my mums that has lived on a certain shelf for the last 2 years. It’s not a shelf that any other books are on, just one he’s decided this book should live on. If he finds the book anywhere in the house he puts it straight back. He’ll occasionally open it slightly and peek inside, but only if it is on that shelf. If you tried to take it down and let him look at it, he would get upset and rush it back to where it came from. It’s as if what’s inside that book is too scary for him, and can only be looked at with the pages slightly open. Tommy used to love lining things up when he was younger. Toy bricks, cars, lego, anything he could find. They all had to be perfectly placed, the way he imagined them in his head. He’d observe them from every angle to make sure he’d got them just so. Lines would snake across the living room, but you were never allowed to be involved in the process. If anything went wrong the whole structure would be destroyed in anger, sent flying across the room, and then he’d start again from scratch. 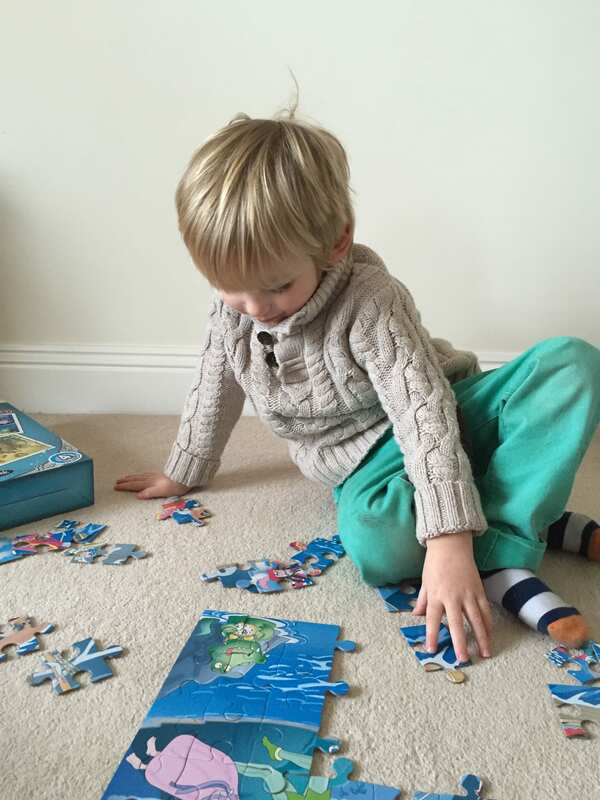 This behaviour continued for about a year or two until the day Tommy discovered puzzles. He absolutely loves them. He can’t get enough of them. On any given day in our house, there’ll be 5 or 6 puzzles assembled spread from room to room. I’ll find puzzles made on the bed, on a window sill, in a box, on the sofa, any flat surface he can find. New puzzles are put together in a flash after only one or two looks at the box for inspiration. I’m sure he has a photographic memory. Once he knows what the puzzle is supposed to look like he just gets on with it until he figures it out. Every puzzle he makes has to be done in a certain order that he’s created. He is always looking for one particular piece, even if others can be put into the correct place instead. Once they’ve become too easy for him he finds ways to make it harder for himself. Puzzles will be mixed up with other puzzles so he has to sort through them and make them all individually. He might keep all the pieces in the box so that he rummages around looking for the exact piece. He’s even taken to building puzzles back to front, so that it is the back of the puzzle piece that is showing. I’ve tried this myself, I still don’t know how he does it. Socially Tommy seems to be comfortable in any environment. 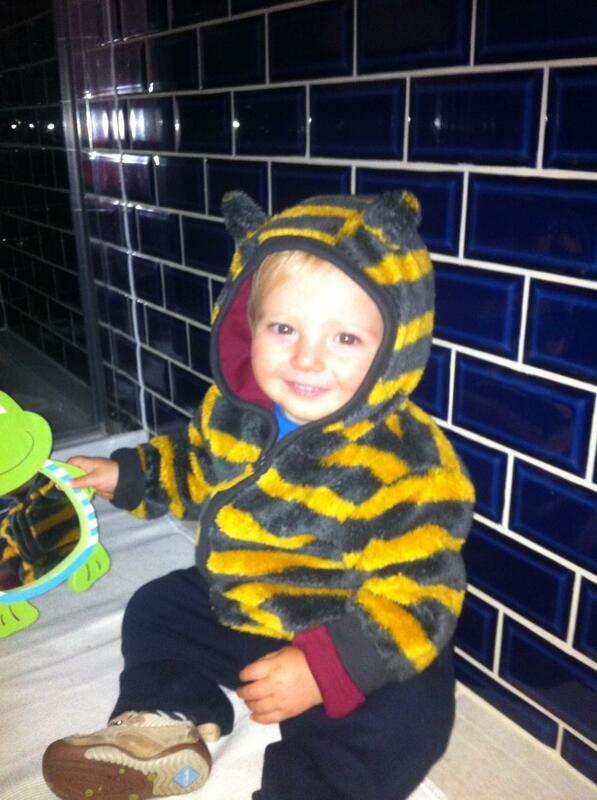 He goes to nursery twice a week and is really happy to be there. He doesn’t interact much with any of the other children, but he isn’t scared or intimidated by them either. He doesn’t feel the need to avoid other children, he just chooses to ignore them. Now and again there are flickers of interaction, usually if he’s watching them and finds something they’re doing funny. If they become too much for him, a loud, piercing scream soon gets them to move out of his way! Unlike Jude, we’ve never had any real problems going to birthday parties, parks, shops, etc. He seems to be able to act as if there’s no-one else there. As long as nobody is trying to stop him from doing what he wants to do, his environment doesn’t seem to affect him. 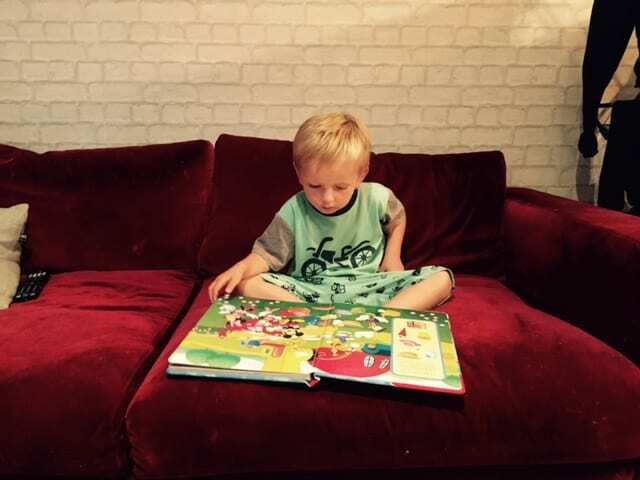 Like his brother, Tommy is currently non-verbal, and it’s a huge frustration of his. He relies on taking us towards whatever it is he wants, thrusting our hand forwards and hoping we can guess what’s going on in his head. He understands that verbal communication can get his needs met more easily, and you can see he is really trying to tell us what he wants. Right now he’s able to make a few speech like sounds, but no actual words have come yet. There’s a connection he’s not quite making, but I’m sure it’s not far away. Sometimes when I talk to him he holds my mouth open and peers in, looking at where the sounds are coming from. It’s like he’s trying to understand why I can make those sounds and he can’t. It will click soon, and when it does his world will open up so much more. So impressed by his puzzle skills and love how he looks inside your mouth to try to understand how the words come out. His puzzle skills really are amazing, future world champion in the making. I spent quite a long time at the RB on Sunday. Tommy was with Victoria, who LOVES him. He was easy if you had the energy to catch up with him. He really enjoyed his time with us. Around the round table and having a “lite bit” he was fascinated with Holly and it was sweet to see him watching her. He is a very happy little boy, there seemed to be no anger there at all. Apparently crabbing was fun and fast, throwing the line and bait was even better. Nice to have you around Tommy. Yes, Tommy had a great day ‘Crabbing.’ He understands how to pull the lines up, even if the temptation to throw the lines into the river is sometimes too hard to ignore! Tommy has always had a need for a certain order, but what that order is changes constantly! Just when you think you’ve got it sussed, he seems to have d a different idea!A lot of the time it is a guessing game, trying to figure out what it is he needs, and some days he can be very emotional and scream a lot. I guess when he is like this I just try to reassure him that it’s ok, that I want to help him, and be very patient with him. Sometimes he will almost shut down and just lay down for a while, or become very clingy, and we just respect that. Yes, finding a way to help him relax is key, I’m sure you will find a way to help him, sometimes, especially when behaviour changes it takes time to discover the real reasons. Also, Tommy used to pose and smile whenever a camera was around, but becoming more difficult now! I’ve just discovered your blog – it feels such a breath of fresh air to read about autistic children who are very similar to my own! Joe (7) is ‘classically autistic’ and largely non-verbal – any verbalisation we get from him is prompted, cajoled or downright bullied out of him, and (probably) the result of years of using PECS. He will very occasionally use a word or maybe two in a string (yay!) to ask for something he really wants. It’s only ever requests for things he wants – he cannot use words to express how he feels, what hurts, what’s wrong, or to comment on anything. Thanks for sharing your blog with us all. Our daughter is 6 and was diagnosed with Autism just before her 3rd birthday. Both Tommy and Jude remind me so much of our daughter. She is not saying many words – just the odd single word here and there – normally when she wants something :). She loves reading books and listening to music and especially loves Peppa Pig. She is very lucky and goes to Main stream school. She has been with the same children since nursery so they all know her well and are use to her stimming and different ways such as running, jumping and flapping. They all look after her and make sure she is ok. When she first started school the children kept asking her teacher why she did the things she does and often came up to me or my wife before and after school with questions about her. This led me to write an illustrated childrens book about my daughter so it could hopefully answer their questions simply, it seems to have worked. Its called “Through the eyes of me” if you are interested. The one big worry I have is when she moves up to Comprehensive school where there will be a whole load of new children who have never met our daughter before and I worry about bullying as children can be so cruel. What I would love to do is to find a few Autistic adults to go around the primary schools making children aware of autism and hopefully this will make them Autism Aware and give them an understanding of autism so they will appreciate a person who has autism more and accept them.